Czechmate Stables offers lessons for all levels and ages interested in riding in the hunter/jumper discipline. We start children as young as seven years of age, with basics such as grooming, tacking up, and basic riding and horsemanship skills.We believe it is important to understand horses' behavior, care, and everyday lives outside the riding arena to fully be able to cooperate and advance in the saddle. Lessons are available to adult riders who have always wanted to ride but have never had the opportunity, as well as those looking to get back into the saddle. For the more advanced rider looking to show, or the college student looking to continue riding through out school, we offer lessons on our horses or yours. We also have several horses available for lease or half-lease on the farm. Trailer-ins are welcome as well, for those boarding their horses elsewhere and looking to take lessons at our farm. We offer year-round private and semi privates on Monday to Saturday . 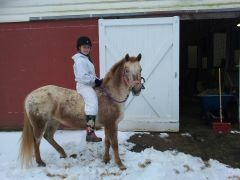 Parents are welcome to watch their child’s riding lesson. One hour and 15 minutes lesson for adults and children ages 7 and up. Students will spend about 15 minutes grooming and tacking up their horse with their instructor, and around 45 minutes riding. They will spend the last 15 minutes untacking and taking care of their horse. One hour and 30 minutes lesson or adults and children ages 7 and up. 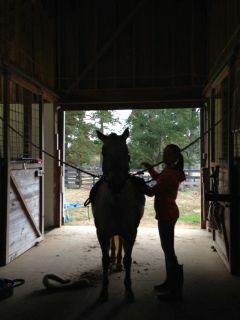 Students will spend about 15 minutes grooming and tacking up their horse with their instructor, and around hour riding. They will spend the last 15 minutes untacking and taking care of their horse. Each lesson is customized to the individual's riding level. In order for us to guarantee you the utmost quality lesson, an evaluation ride is mandatory for all of our clients. There is no refund to participants who cancel within 24 hours of the lesson. Considerable time goes into planning lessons with instructors and reserving horses for riders, therefore it is the responsibility of the rider to come to lessons and be on time. In the event that the instructor cancels a lesson, a make-up lesson will be re-scheduled at the convenience of the rider. A) All lessons need to be cancelled prior to 24 hours from your lesson or you’ll be charged the full price of your riding lesson. Q) How do I pay for my lessons? A) Deposit is required at evaluation lesson. Lessons are billed month advance. A) No, we have clean helmets you can borrow. However, we would recommend getting a helmet if you plan on riding regularly. Bike riding helmets are not allowed. A) Yes, if your child has a boot with a ½ inch-1 inch heel, that covers their ankle. Q) What's an Evaluation Ride? A) It is an initial first lesson, mandatory for every student. In this lesson, our instructors educate the student - step by step - on the grooming and tacking up process. 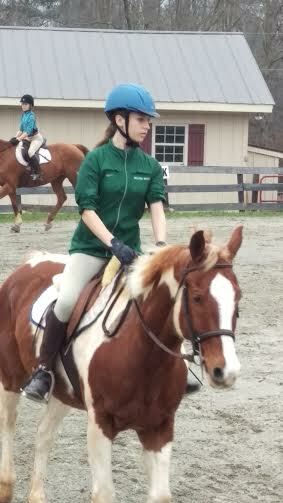 Then the student is evaluated riding the horse.